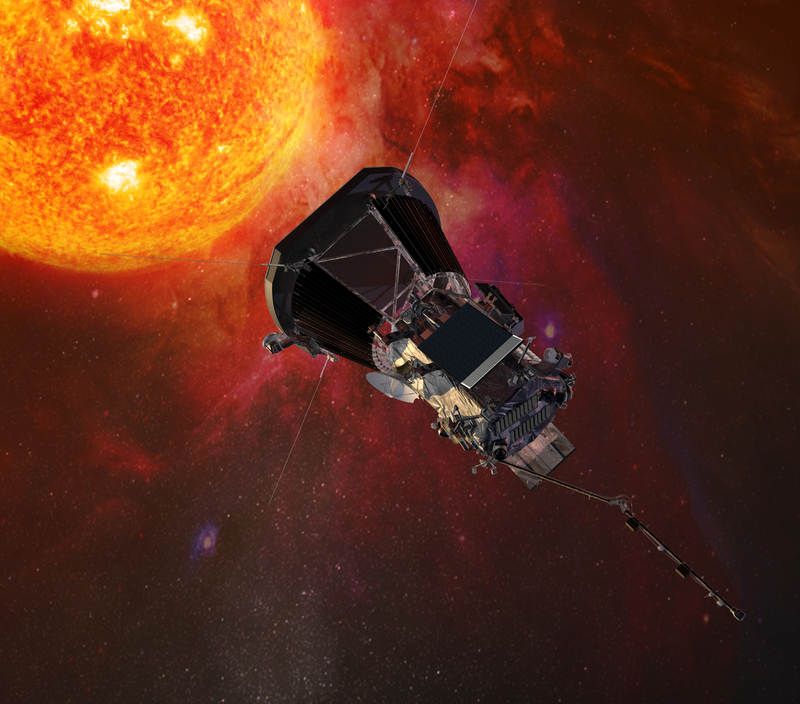 Every instrument and system on board Parker Solar Probe (with the exception of four antennas and a special particle detector) will be hidden from the sun behind a breakthrough thermal protection system (TPS)—an eight-foot diameter shield that the spacecraft uses to defend itself against the intense heat and energy of our star. Every system will be protected, that is, except for the two solar arrays that power the spacecraft. When the spacecraft is closest to the sun, the solar arrays will be receiving 25 times the solar energy they would while orbiting Earth, and the temperature on the TPS will reach more than 2,500F (1,370C). The cooling system will keep the arrays at a nominal temperature of 320F (160C) or below. The incredible heat of our star would damage conventional spacecraft arrays. So, like many other technological advances created especially for this mission, a first-of-its-kind actively cooled solar array system was developed by APL, in partnership with United Technologies Aerospace Systems (UTAS) in Windsor Locks, Connecticut (which manufactured the cooling system) and SolAero Technologies of Albuquerque, New Mexico (which produces the solar arrays). The Parker Solar Probe cooling system has several components: a heated accumulator tank that will hold the water during launch (“If water was in the system, it would freeze,” Lockwood said); two-speed pumps; and four radiators made of titanium tubes (which won’t corrode) and sporting aluminum fins just two hundredths of an inch thick. As with all power on the spacecraft, the cooling system is powered by the solar arrays—the very arrays it needs to keep cool to ensure its operation. At nominal operating capacity, the system provides 6,000 watts of cooling capacity—enough to cool an average-sized living room. Somewhat surprisingly, the coolant used is nothing more than regular pressurized water—approximately five liters, deionized to remove minerals that could contaminate or harm the system. Analysis showed that, during the mission, the coolant would need to operate between 50F (10C) and 257F (125C)—and few liquids can handle those ranges like water. “Part of the NASA technology demonstration funding was used by APL and our partners at UTAS to survey a variety of coolants,” said Lockwood. “But for the temperature range we required, and for the mass constraints, water was the solution.” The water will be pressurized, which will raise its boiling point above 257F. The cover glass on top of the photovoltaic cells is standard, but the way the heat is transferred from the cells into the substrate of the panel, the platen, is unique. A special ceramic carrier was created and soldered to the bottom of each cell, and then attached to the platen with a specially-chosen thermally conductive adhesive to allow the best thermal conduction into the system while providing the needed electrical insulation. 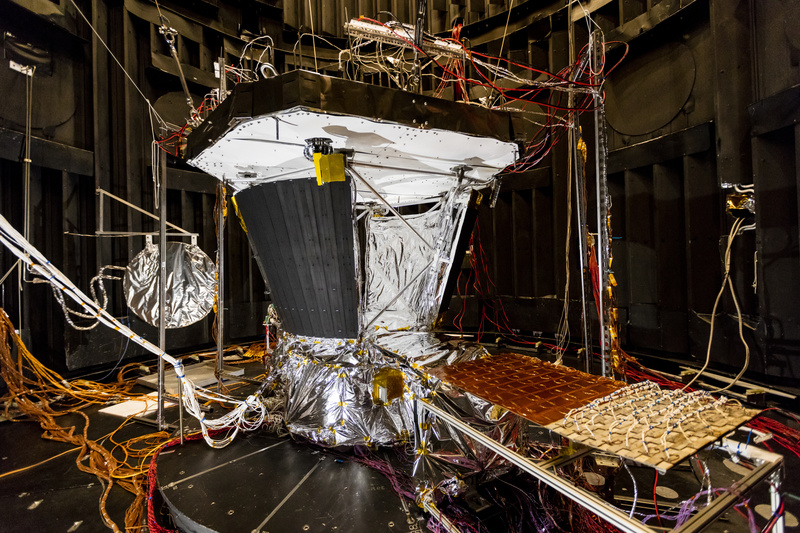 When Parker Solar Probe launches on board a ULA Delta IV Heavy rocket from Cape Canaveral Air Force Station, Florida, in the summer of 2018, the cooling system will undergo wide temperature swings. “There’s a lot to do to make sure the water doesn’t freeze,” said Lockwood. First, temperatures of the solar arrays and cooling system radiators will drop from that in the fairing (about 60F, or 15C) to temperatures ranging from -85F to -220F (-65C to -140C) before they can be warmed by the sun. The pre-heated coolant tank will keep the water from freezing; the specially designed radiators—designed to reject heat and intense temperatures at the sun—will also survive this bitter cold, thanks to a new bonding process and design innovations. Less than 60 minutes later, the spacecraft will separate from the launch vehicle, and begin the post separation sequence. It will rotate itself to point at the sun; the solar arrays will release from their launch locks; the arrays will rotate to point to the sun; a latch valve will open to release the warm water into two of the four radiators and the solar arrays; the pump will turn on; the spacecraft will rotate back to a nominal pointing orientation, warming up the two coldest and unactivated radiators; and power from the cooled solar arrays will begin recharging the battery. When Parker Solar Probe is hurtling past the sun at some 430,000 miles an hour (724,000 KPH), it will be 90 million miles from mission controllers on Earth—too far for the team to “drive” the spacecraft. This means that adjustments to how the spacecraft is protecting itself with the TPS need to be handled by Parker Solar Probe’s onboard guidance and control systems. These systems use new and effective autonomous software to allow the spacecraft to instantly alter its pointing to maximize protection from the sun. 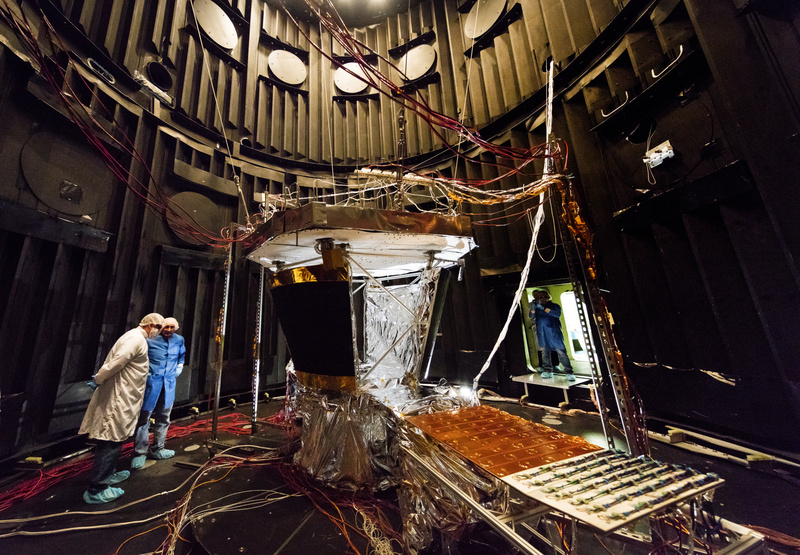 This autonomous capability is critical to the operation of the spacecraft’s solar arrays, which must be constantly adjusted for optimal angle as Parker Solar Probe hurdles through the sun’s harsh, superheated corona. The solar array cooling system for the Parker Solar Probe spacecraft—one element of which is the large, square black radiator visible at center, one of two that will be installed—is shown undergoing thermal testing at NASA Goddard Space Flight Center in Greenbelt, Maryland in late February. The solar array cooling system for the Parker Solar Probe spacecraft—one element of which is the large, square black radiator visible at center, one of two that will be installed—is shown undergoing thermal testing at NASA Goddard Space Flight Center in Greenbelt, Maryland in late February. At left: William “Chip” Delmar and C. Jack Ercol of the Johns Hopkins Applied Physics Laboratory; on right, Mike Micciolo of NASA Goddard and APL’s Eric Wallis.